Grant manager access to Ento for other managers or supervisors to share the duties of managing your workplace. Add managers with full access to the Ento account (super managers), control their access level, or limit to specific locations and staff. 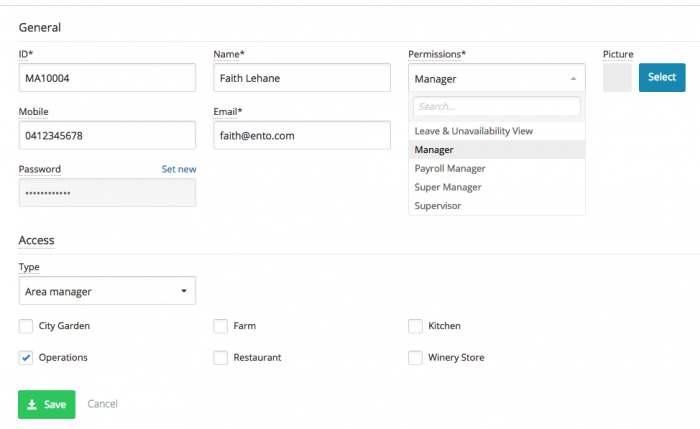 The simplest way to add managers is individually, and even if your implementation consultant uploaded all of your managers when setting up your account, you’ll very likely need to update manager permissions or details, and create additional managers in time. To view existing managers and add new ones, go to Core HR > People > Managers and click Create new. Complete all the fields, ensuring you have the correct manager permissions profile, which determines what the manager can see and do, and the correct access level, which determines the level of access in the Type drop down of the Access to section. If you are using permissions based features like cost visibility restrictions, such as preventing managers from seeing other managers’ base rates or shift costs, use the same Staff ID for their Manager ID, linking the manager profile to their staff account. Open the Type dropdown list and select ‘Managers’. More general information on preparing import files can be found in Importing data overview. Below is a breakdown of all the fields for a manager profile. ID* MA10001 A unique identifier for the manager record. An ID can be comprised of text and/or numbers up to 20 characters in length. If the ID used belongs to an existing deleted manager, it will be un-deleted. First name* Michael The manager's given name. This will be used when the system communicates with them. Last name Cartwright The manager's surname. Permissions MP10001 The Permission profile associated with the manager, which dictates what they can view and which tasks they can perform in the system. Permission profiles can be created and edited on the 'Settings -> Manager permissions' page of your account. This field defaults to first non-deleted permission profile. Picture http://rosterplus.com.au/staffpics/michael.cartwright.jpg A photo of the manager, used within the system to help you visually identify them. The file you upload should be in .png, .jpg, .jpeg or .tiff format. The file will be resized to 120x120 pixels on upload and should be no larger than 4MB. Phone 0486543213 The managers phone number (landline or mobile). Email* michael@arpeegolfclubs.com The manager's email address. This should be a single string of text containing an @ symbol and at least one full stop. The email address is also used by the manager to login. Temp Password hg$df5ko Fill in if you would like to specify a new temporary password the manager needs to use to log in. If not specified and the manager is new, a random password will be generated. Type* store The type of manager. Controls what areas and staff the manager can see. If the manager has type 'company', they will be able to see all areas and staff. Must be either be the singular name the company uses for areas e.g. 'store' or, 'company'. Enterprise customers can also use their group names. Access to Each of the 'types' the manager has access to. If the manager type is 'company' this field will not show.